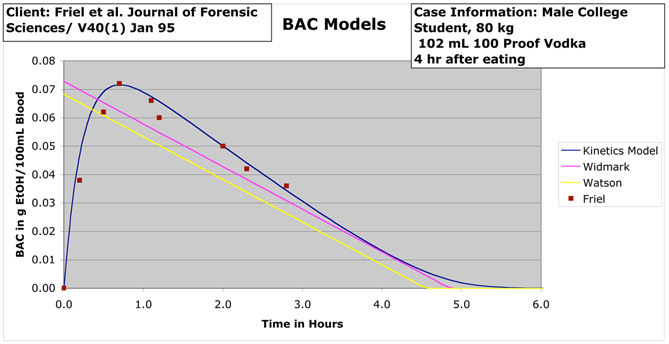 Although several different models are used to determine an individual’s Blood Alcohol Concentration (BAC), the “Kinetics Model” is most frequently used. The Kinetics Model allows for variable intakes of alcoholic beverages, can be modified for delay of absorption due to meals consumed and takes into account the individual’s height, weight and age. The model uses first order stomach emptying, first order intestinal emptying, and Michaelis-Menten capacity limited hepatic elimination. The most common uses of these models are (1) to predict the BAC of an individual at the time of motor vehicle operation given the alcohol consumption and bodily characteristics or (2) to work backward from the time of a chemical test to the time of operation. An example of the graphs produced is shown below. A written report with opinions is presented in either letter or affidavit format. Individuals wishing this service must fill out the Profile Questionnaire found on the Forms/Resources page of this site.